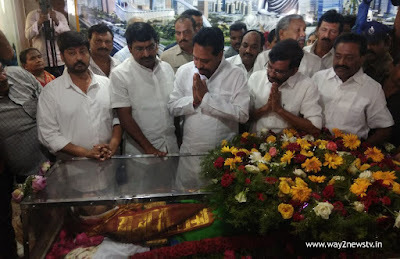 Some of the ministers were paid tribute to the late TDP leader and former MLA Anam Vivekananda Reddy at Kapu street in Nellore.Agriculture Minister Somireddy Chandramohan Reddy, District In charge minister N. Amarnath Reddy, MLC, TDP District President Beeda Ravichandra and local leaders paid tributes to Anam.Minister Somireddy said that there is a 60-year relationship between Allipuram and Rajupalem somireddy and Anam families.Apart from political battles, affection, affiliation, and Intimacy continue to exist between two family members. Despite being from a political background, he praised the politician Mass Vivekananda Reddy who was in the midst of the people.Traditionally from the family of values ​​made from politics. Vivekas are unnamed in the state. He is a particular style in the hands of problems. Unfortunately, she is suffering from illness and unable to digest. Vivekha prayed to God to give peace to the Holy Spirit and to give their family members a boon.